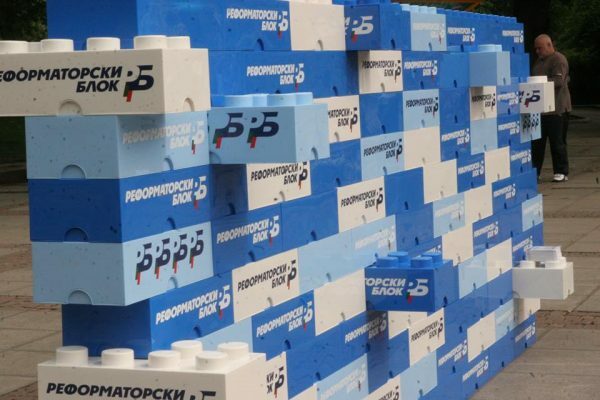 While it may seem a fiction given that Bulgaria’s political parties old and new have been in campaign mode for months, the weekend of April 26 and 27 saw the official launches of their campaigns ahead of the country’s May 25 2014 European Parliament elections. There are 15 parties and six coalitions competing for the votes of about 6.9 million eligible voters in Bulgaria in the election of the country’s 17 MEPs. 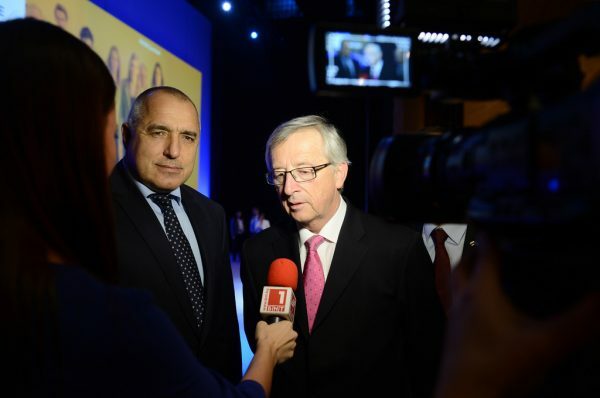 Centre-right GERB launched its campaign on April 27 at Arena Armeec in Sofia, with Jean-Claude Juncker, the European People’s Party candidate for European Commission President, as its star guest, and with a video message from EPP president Joseph Daul. Juncker said that he supported Borissov, his party and Tomislav Donchev, head of the GERB ticket in the European Parliament elections, because all of them and the party itself were a guarantee for the European future and progress of Bulgaria. Daul said that GERB (known as such by its Bulgarian abbreviation, which also means coat of arms, while the party’s full name translates into English as Citizens for the European Development of Bulgaria) deserved its name. He said that the May 25 elections were vital for Europe’s future, and voters would be choosing a vision for Europe. “Populists do not know the truth. Their only task is to foster fear to hold the electorate. They serve foreign interests. Socialists have problems with the truth. They spend more than they earn,” said Daul, who added that when in office, the GERB government had the confidence of its European partners and Bulgaria had a future. Donchev told the launch event, “Today we must create wealth, not debt”. A former EU funds minister, Donchev said, “We were able to preserve Europe and Bulgaria during the crisis – something we are proud of.” Now the task and duty were to defeat populism and disillusionment. Europe meant higher standards in education, new investments, modern agriculture, a functioning justice system, more democracy and respect for civil rights, he said. 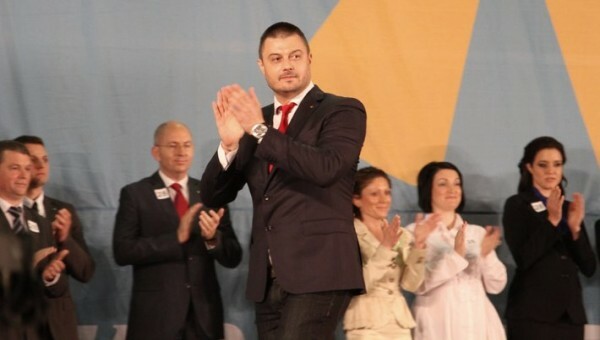 Donchev based his appeal to voters on the party’s track record in government, saying that it had chosen not the easy roads, but the right ones. “We have proved that we can and we know that Bulgaria has no time to lose,” Donchev said, the last phrase a reference to GERB’s European Parliament election campaign slogan. Borissov said that the May 25 election was not just a battle for the European Parliament, but a battle between good and evil. 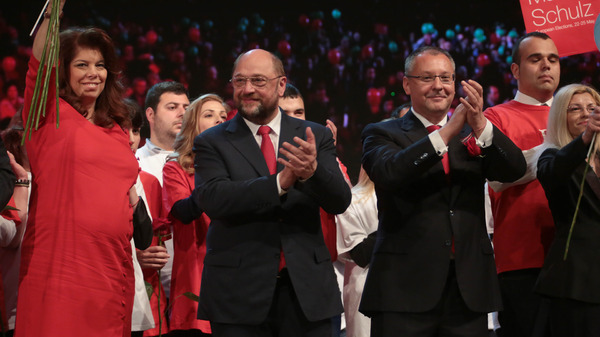 The Bulgarian Socialist Party, campaigning under its Coalition for Bulgaria brand, held its campaign launch on April 26, with its star guest being Martin Schulz, the Party of European Socialists’ (PES) candidate for EC President. 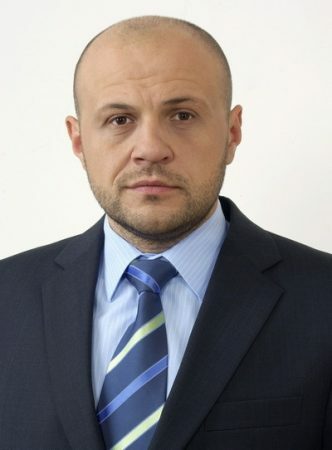 Sergei Stanishev, leader of the BSP and of PES, told an audience that the party claimed added up to 5000 that their opponents – a reference to GERB – were not reconciled to being ousted from government in Bulgaria in May 2013: “They are seeking revenge and again want to strike fear into the hearts of the people”. “It is important that on May 25, with our vote, the will of Bulgaria’s citizens is expressed, ‘there is no turning back’,” said Stanishev, who is also his party’s list leader in the May 25 vote. He said that his party had returned Bulgaria to the path of democracy, “repression has ceased” and the government of Plamen Oresharski had achieved a lot. The government’s policy, according to Stanishev, was to restore the state, a social commitment, concern for the people and the rebirth of the Bulgarian economy, creating new jobs and decent incomes for people. Stanishev hit out at the record of the EPP, saying that for 10 years, the life of all European institutions had been dominated by the right. During this time, Europe had lost dynamism, had entered a financial, economic, social and political crisis, and the EU was “losing power, the power of hope”. “The European idea, so beautiful, so inspiring for generation, has lost its power. The responsibility for this lies with the policies of the EPP,” Stanishev said. The Movement for Rights and Freedoms, the third-largest out of four parties in the 42nd National Assembly and seen in polls as likely to run third in winning seats in the next European Parliament, seemed to be the exception in not holding a formal campaign launch event on the weekend that followed the April 25 official start of the campaign period. Ataka leader Volen Siderov launched, somewhat unconventionally, the European Parliament election campaign of his party in Russia’s capital Moscow, where he also received the Russian state order the Patriotic Star, voted him by the upper house of the Russian parliament. According to a media statement by the far-right, ultra-nationalist party, Siderov – list leader for Ataka in the European Parliament elections – and his fellow candidates will be the voice of Bulgarians who want the EU to be changed or be disbanded. At the April 25 event, Siderov said that Ataka believed that the EU was now a puppet of the US, and this must end. “We believe that Bulgaria should be militarily neutral and not a member of Nato. We are convinced that Bulgaria and Europe should develop friendly cultural and economic relations with Russia, not quarrel with it,” Siderov said. He said that if he became prime minister, Bulgaria would get out of Nato and restore full relations with Russia, “which we consider a fraternal country”. In receiving the state honour from Russia, he said that he wanted to convey to Russia fraternal greetings from the majority of Bulgarian people who liked the Russian people and who remember that it was fraternal Russia, not the European Union, that had liberated Bulgaria from the “Turkish yoke”. 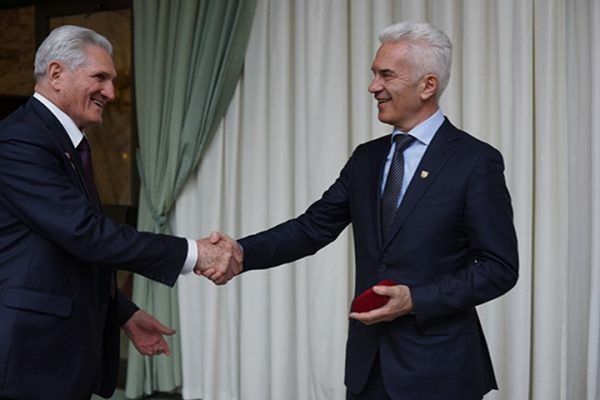 “Thank you for the honour, I wish success to the Russian leadership in strengthening the state and the brotherly Orthodox Russian people,” Siderov said. Nikolai Barekov, leader of Bulgaria without Censorship (BWC) and top of the list of the party’s MEP candidates, said at the BWC campaign launch in Plovdiv that within a five-year period, his party would raise the Bulgarian state from the ruins. 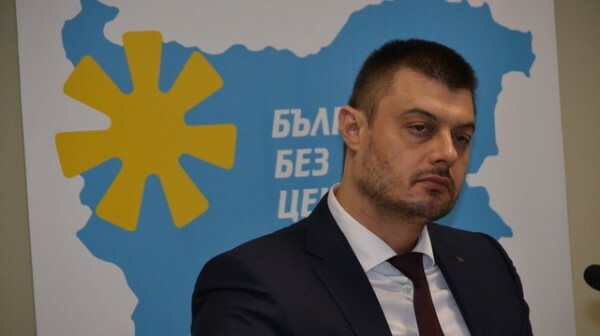 Barekov, whose BWC is standing in the European Parliament elections along with three minor parties, pledged that his party would take Bulgaria out of the hands of the political oligarchy and return it to its people. He said that the campaign would enable BWC and its VMRO coalition partner to achieve “such a result that removed forever from the scene would be the most hated political party, the MRF”. Barekov said that several members of the MRF would be investigated and brought before the law. He said that the other problem was the “bipartisan oligarchy” – an apparent reference to GERB and the BSP. Barekov said that one half of this status quo was “the party of Bulgarian organised crime”, which he meant GERB and whose leader Borissov would be in jail after BWC took power, “he will keep his buddy (former interior minister and GERB deputy leader Tsvetan) Tsvetanov company”. 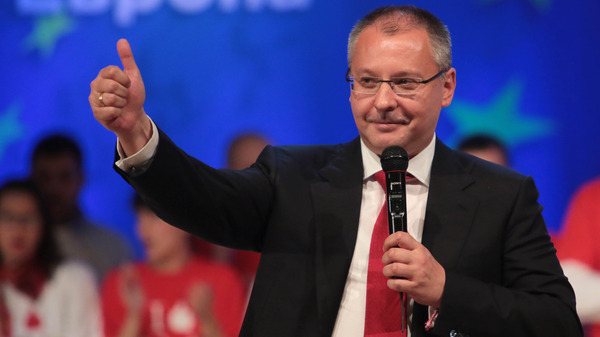 Barekov also hit out at BSP leader Sergei Stanishev, referring to him as the husband of Monica Stanisheva “who allowed his wife to rob the state of EU funds and sell his own party to the MRF”. He said that it was essential to have a result in the May 25 European Parliament elections that would initiate early national parliamentary elections. “Boiko Borissov will not say when the elections will be, the people will say when they are,” said Barekov, who added that in November, Bulgaria would have a new government with a new prime minister. The Reformist Bloc, an alliance of a number of centre-right and right-wing parties formed in 2013 after the early parliamentary elections in which none of its constituent parties won seats, launched its European Parliament election campaign on April 27. Ahead of the campaign launch, Juncker held a meeting with Reformist Bloc European Parliament ticket leader Meglena Kouneva. “These are the first elections of the Reformist Bloc as a coalition. We will lead a lonely campaign – without allies, without the media, but we will not give in, will not go away,” said Radan Kanev, spokesperson for the Reformist Bloc and leader of one of its constituent parties, the Democrats for a Strong Bulgaria. 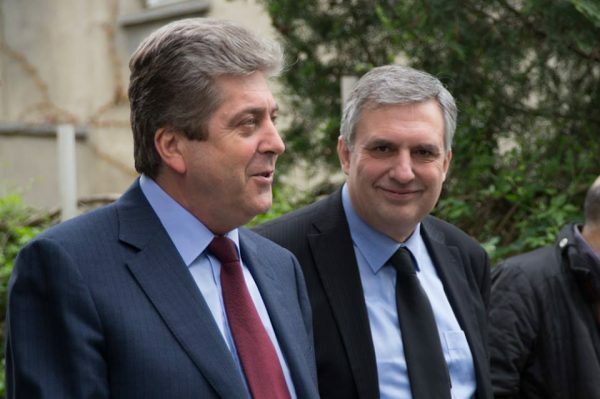 Also launching its campaign on April 27 was ABC, the socialist splinter led by Georgi Purvanov and which has MEP and former foreign minister Ivailo Kalfin as its list leader. Purvanov said that ABC wanted to show that the choice of Bulgarian citizens could not be limited to GERB and the BSP. He said that while ABC had come late to the campaign, it had already built structures in almost all municipalities in Bulgaria. According to Purvanov, there were 13 differences between ABC and other parties, including its resistance to behind-the-scenes games. Kalfin said that the elections would be the toughest for Bulgaria, because of the high election threshold for seats in the European Parliament and reluctance among Bulgarians to vote in the European Parliament elections.